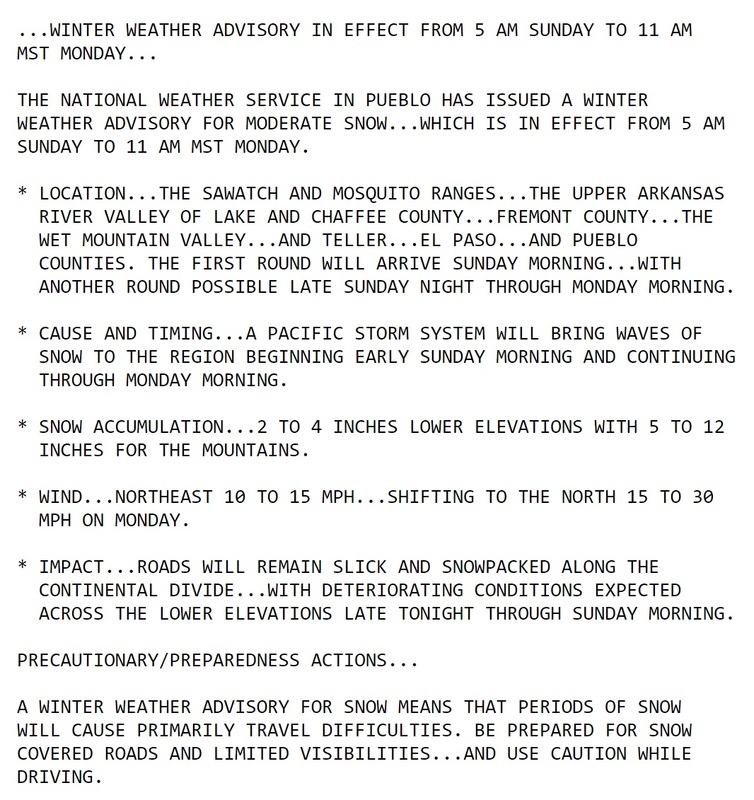 The National Weather Service office in Pueblo has issued a Winter Weather Advisory for El Paso county, including our UCCS campus, from 5:00am Sunday through 11:00am Monday. This entry was posted in Uncategorized on January 14, 2017 by tstoeckl. 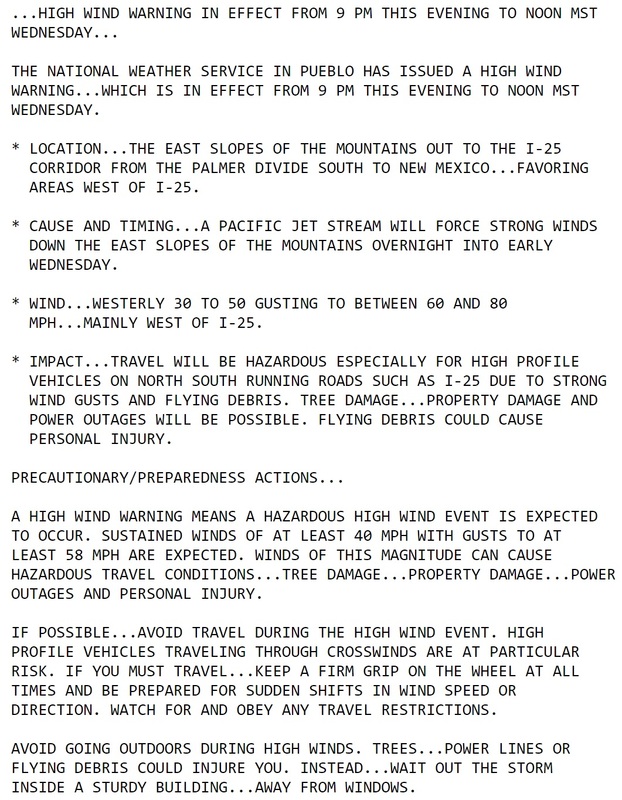 The National Weather Service in Pueblo has issued a High Wind Warning from 9:00pm tonight through 12:00pm on Wednesday. This entry was posted in Uncategorized on January 10, 2017 by tstoeckl. 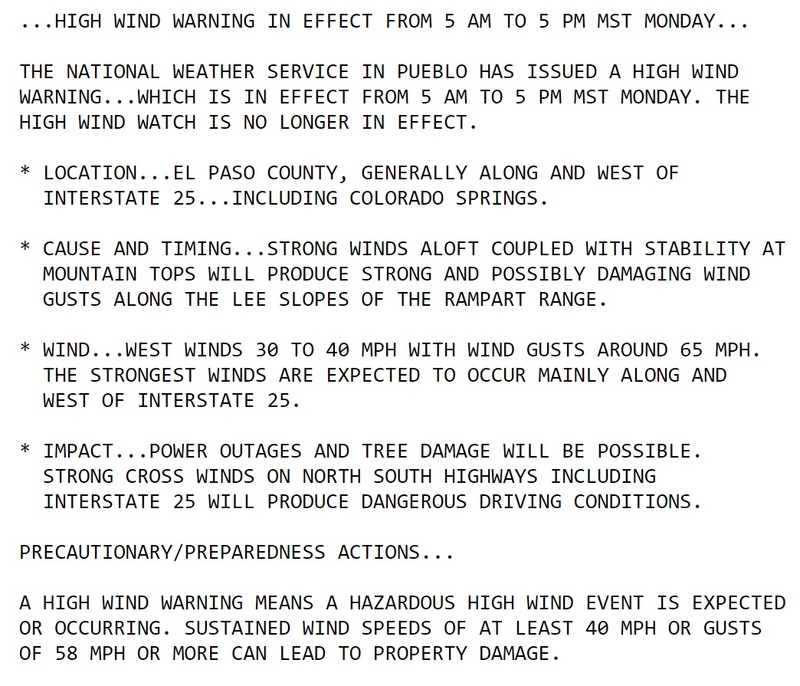 UPDATE: The High Wind Warning has been EXTENDED until 8:00pm tonight. Wind gusts to around 60mph are possible through this evening. 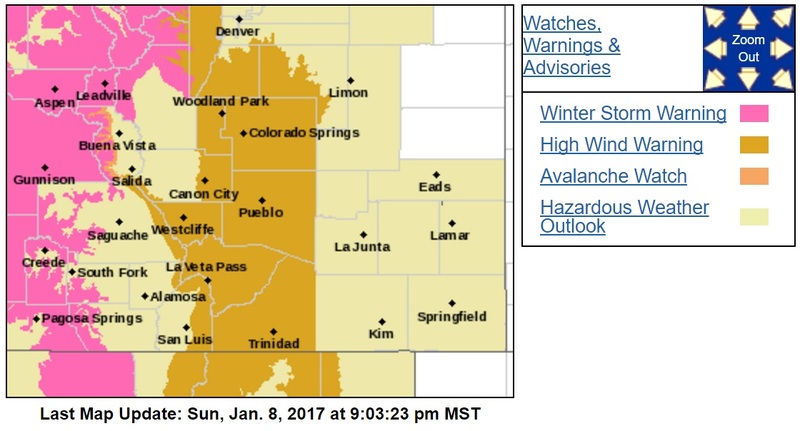 The National Weather Service in Pueblo has issued a High Wind Warning from 5:00am to 5:00pm on Monday, January 9, 2017. Winds are forecast to reach 35-40mph, with gusts up to 60mph. 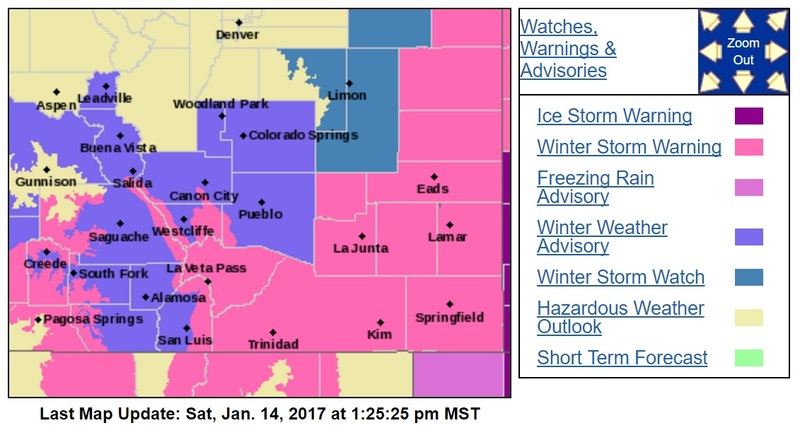 Stronger winds are likely west of I-25 during the period. This entry was posted in Uncategorized on January 8, 2017 by tstoeckl. 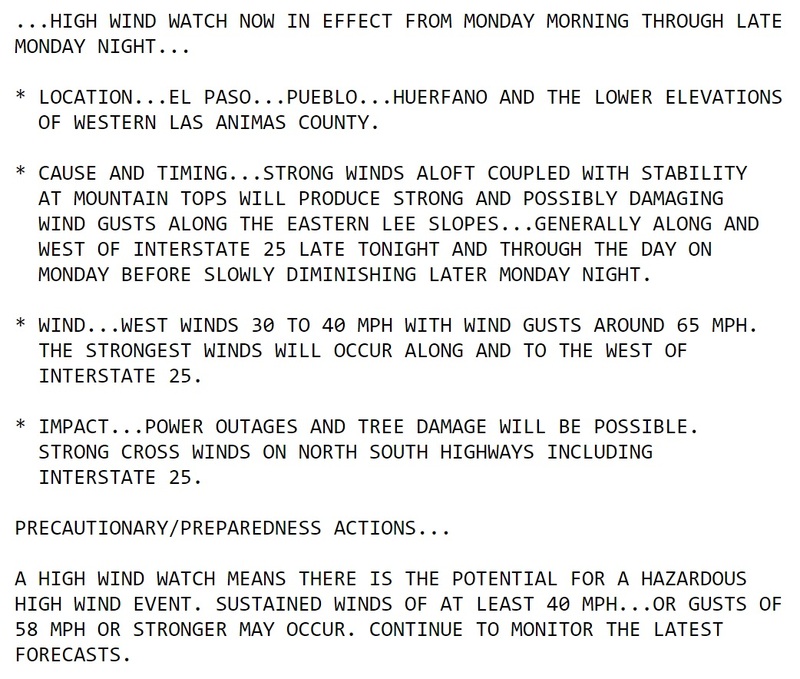 National Weather Services Pueblo has issued a High Wind Watch, in effect from 8:00am Monday through 5:00am Tuesday. A High Wind Watch means there is potential for a hazardous wind event in our area. 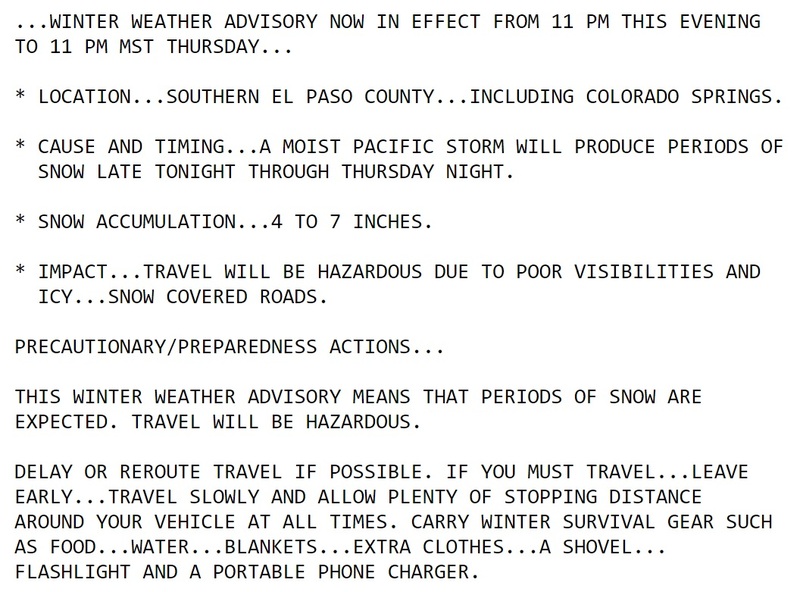 UPDATE: The National Weather Service Pueblo has issued a Winter Weather Advisory for our area from 11:00pm this evening through 11:00pm Thursday, a reduced time frame from the original advisory which ran until 5:00am Friday. Snow, cold temperatures, and wind chill values near or below zero will be our greatest impacts. Stay tuned to local forecast information for the latest details. This entry was posted in Uncategorized on January 4, 2017 by tstoeckl.